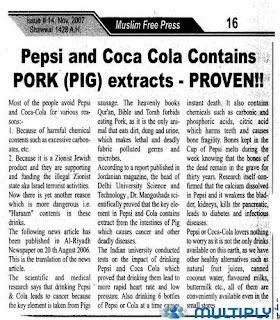 PEPSI & COCA COLA contains Pork extracts, Ye ke? PEPSI & COCA COLA contains Pork extracts? Kemudian Sila baca berita di bawah ini..
A travel agency is suing Selangor police chief Khalid Abu Bakar and his wife for 'unpaid' business class air tickets from Kuala Lumpur to London and back amounting to RM41,868. Besides the ticket price, Global Holiday Sdn Bhd is seeking eight percent in interest from the date the summons was issued and also other costs and relief deemed appropriate. However, Khalid claimed that he paid the full amount to the ticketing agent who issued the tickets to him in 2007.